Please submit your nominations by Friday, January 11th. Finalists will be posted on Sunday, January 13th. Winners will be announced at the banquet. For the Fleet Doctor Fall Mini Bracket Series Race #6 and Test & Tune tomorrow, Sunday, October 21st, we are making the decision to officially push back the start time for the day to noon. Our gates will open at 11 AM and we will be getting started on track at noon. We will, also, be doing all of our racing as 1/8 mile. There will not be 1/4 mile racing tomorrow. The eighth race of the Fleet Doctor Bracket Points Series was this past Sunday. It was a race-filled couple days where many families got to camp out for the weekend. We had bonuses going on Saturday & Sunday with Saturday’s purses being increased thanks to some of our sponsors like Fleet Doctor, Amsoil, Masta Performance Pro, McCormack Racing, and Rocky’s Pit Stop. Sunday the track sweetened the pot by adding on a Gold Card for the rest of the season to each of the four winners in addition to the usual payout. McCormack Racing Sportsman winner, Chris Klein, was .015 which gave him a great start to taking out Tony McKinney in the final round. Klein was on the brakes and ran an 11.568 on his 11.50 dial in while McKinney broke out by .004. In the S&S Customs Super Pro Motorcycle class, Joe Novak Sr. and Mike Mullendore lined up in the final round. Novak Sr. won the race and the Gold Card, but the runner up finish gave Mullendore quite the jump in the points landing him in second place after this week. 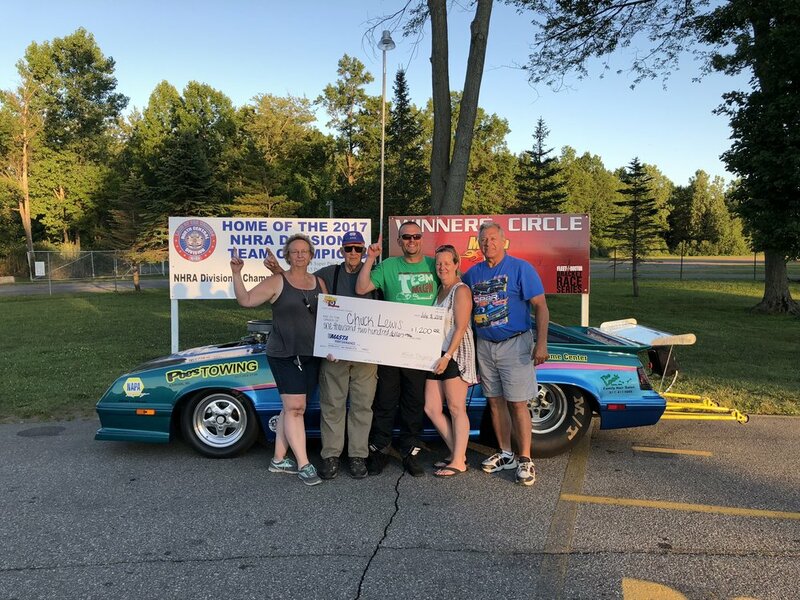 In the final round of Insurance Man Super Pro, two NHRA Division 3 champions lined up in the final when Carl Keil and Tim Buckley faced off. Keil left the line first with a .008 while Buckley left second with an .036. A 4.889 finish on his 4.87 dial in was good enough for the win for Carl Keil. 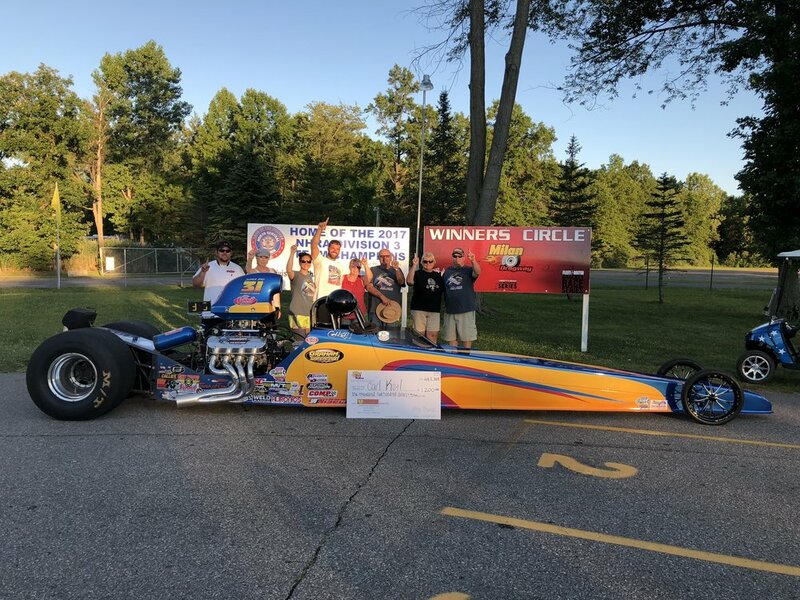 Chuck Lewis, another previous NHRA Division 3 champion, won the Masta Performance Pro category for the second week in a row. Runner up, Jonathon Chatman, left the line first with a -.002 red light. Lewis left second with an -.011 red light. Lucky for Lewis, we have not implemented TruStart or he would have handed the win over to Chatman. Both drivers ran on their dial ins, Chatman with a 4 and Lewis with a 9, it would’ve been a close race had they both been green! Check out the updated points standings here. Sunday: The winner in all four classes gets a gold card good for the rest of the bracket races this season PLUS the usual payout! The Fleet Doctor Bracket Points Racers dealt with another scorching hot race day, but as long as its dry, we won’t complain! This was a fun day, but this upcoming weekend is going to be even better! As we have two days of bracket racing, three races, AND some bonuses up for grabs. PLUS, we have the July Edition of our Aeroquip Heads Up Race on Friday night with FIREWORKS! The first win of the day went to Ron Raymond in the S&S Customs Super Pro Motorcycle class over Justin Hughes. Raymond had the lesser breakout giving him the win. It was a tight race though as Hughes was .022 off the line to Raymond’s .018. This win helped Raymond increase his lead in the points. Daniel Beauch took the win in McCormack Racing Sportsman after Donnie Hagar went through the finish line first on a breakout pass, running a 14.015 on his 14.03 dial. Beauch ran dead on his dial for the win. Insurance Man Super Pro winner, Justin Hardy, took out Jack Kassin in the final round. Kassin fell victim to leaving the starting line too early with a red light against Hardy. Red lights were a plague in the last two rounds as it turns out since this is what took out Kendallyn Jacobs when she had lined up against Jack Kassin in the semi-final round. This win sent Justin Hardy to the top of the points standings, tying him for first place with Carl Keil. Chuck Lewis got his first win in the new car in Masta Performance Pro over runner up Darrell Ciaravino. Both Lewis and his car were on a mission Sunday. Ciaravino’s breakout in the final round, handed the win over to Chuck Lewis and Lewis Family Racing. Check out the points standings here.